We are the World Champions. This is kinda awkward that after writing a post “10 reasons why I love Football, FIFA than Cricket” that raised quite a few eyebrows, I am compelled to write about Cricket. Yes, because like every Indian lad, I was also born with Cricket, watching Sachin Tendulkar. I love FIFA but I do not follow club matches. I am not mad about IPL either. I love anything when it comes to patriotism, & conforms to national pride. This, my friends, was an overwhelming moment in the history of Cricket for every single person of this Nation, apart from few women who never understand Cricket & also won’t understand why men love Cricket so much. 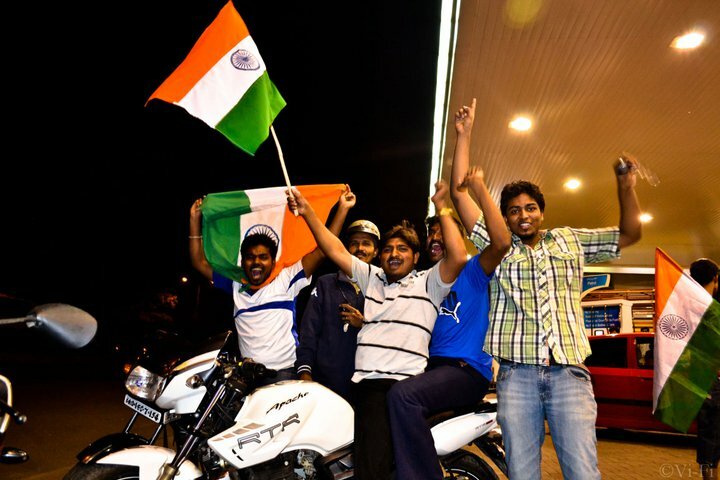 India becomes World Champion in Cricket, bagging the ICC World Cup 2011 home, and right at home. It’s not just about being World Champions in ODI, but we are ranked #1 in Test Cricket which is the then genuine form of Cricket, when introduced as a sport. Without any further introduction, let me talk about the moments that led to the historic victory. Again, this was the 1st Cricket WC being played in the life-driven Social Networking era, where people aren’t just watching the match on TV or elsewhere but simultaneously playing it right through their statuses on Facebook & Twitter. Let me make this clear guys, we r not a team that was during Mohd. Azharuddin, where once Tendlya went out, d next hope were Azhar, then Jadeja! We’ve a much better team who av gotten us into finals by beating the 3 time WC Champs – AUSTRALIA! All pessimists, please book ur tickets to Lanka….MAIN AAG LAGANE WALA HOON unko! Jai Bajrangbali! Jai Hind! The entire thread is here. 3 nervous hours pass by; Dhoni registers the winning moment by hitting the 2nd six, & making me feel like Paul, The Octopus! 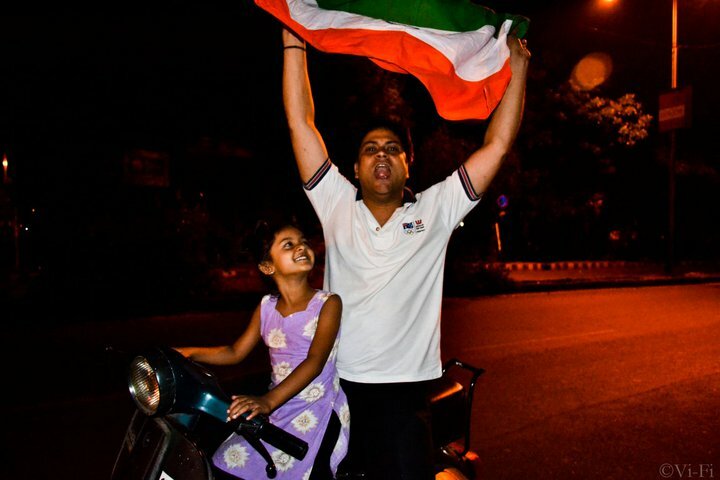 Jubilant to the core, I get on the bike with my camera packed and get out on the streets to capture frenzied faces of overwhelmingly ecstatic fans of Bangalore. Below are the few shots I took of the electrifying crowd celebrating with inexplicable joy with what we call a “Once in a Blue Moon” feeling. The scene at the petrol bunk. The people who thought I was a press reporter, and that I should click them. I said Yes, I work for Indian Express. They kept posing until I tried to escape. Right then, what I felt as I kept clicking, is that there were 3 kinds of people in these events who get us all the happiness, sacrificing their’s. 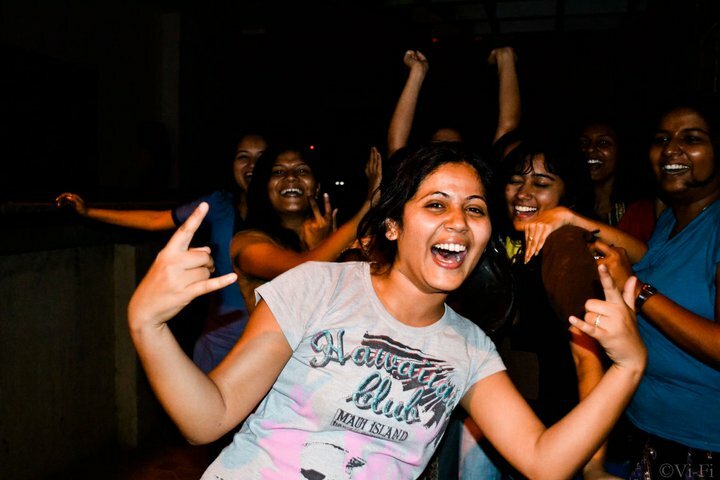 You see everyone dancing, cheering; you too wish to be a part of it but your real happiness is in ‘not-disturbing’ & ‘preserving’ these precious moments forever! Back home, I switched on the TV to catch up with the trophy lifting ceremony I missed. The pictures of the tears of joy in the eyes of Sachin was quite an emotional moment, for almost the entire nation, young and old, which has seen him playing since 1989. I was 12 years old, yet the memories of his 1996 World Cup’s contribution to India is still so vivid. He was just a one man team then. But today the Boys in Blue have aptly paid him the “Guru-Dakshina”, the much longed tribute for all the time he has served the nation. It was as if all his pain for 21 years had been healed. And having seen 6 World Cups, this one’s special where he has felt that fullness of life, and it’s so worth it. With Dhoni speaking his straight talk as usual, must have surely silenced his critics. I always had my deep faith rested on him. He’s the coolest captain of Indian Cricket Team could have ever had. I wasn’t born in 1983, so I can’t comment on Kapil Dev. It was definitely a moment of pride that was felt after 28 long years, a moment that will linger on Indian hearts and soul for the next 4 years for sure. For we can now flaunt to the entire world that we’re the proud citizens of a nation of billions, i.e. India who’s #1 at the T-20s (right when the format was introduced, 2007), #1 in Test Cricket and #1 in ODIs. We are the leaders in Cricket. We are WORLD CHAMPIONS! Vande Mataram.